This recipe has been adapted slightly from Weight Watchers and it's listed as being worth 3 points HOWEVER, I saw that there is a typo (they have listed 1 TBSP of sugar and it is really 1 Cup of sugar, as stated later in the recipe)therefore I'm not sure which way they based their points. *Place muffin liners in a 12 hole muffin tin - I actually got 14 muffins which also could possibly affect a slight reduction in points. * In a large bowl, combine 2 cups of flour, baking soda, baking powder and salt; set aside. *Using an electric mixer, beat egg with 3/4 cup of sugar in a large bowl until light and fluffy. Add sour cream and milk and beat until thoroughly combined; blend in vanilla extract. * Add mixture with flour, baking soda, baking powder and salt. Beat until smooth. 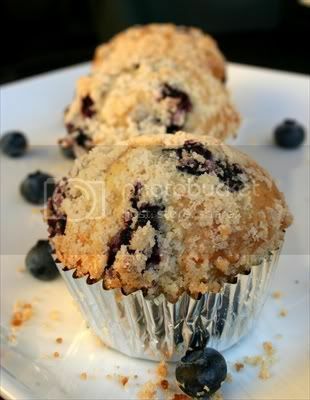 * Fold in blueberries (make sure you coat them with flour so that they don't sink to the bottom of your muffin) and fill each muffin liner about 3/4 full; set aside. *Combine remaining 1/4 cup each of the flour and sugar. Pour in melted butter and combine with finger tips (if it is too moist add equal parts of flour and sugar until it looks like crumbs). 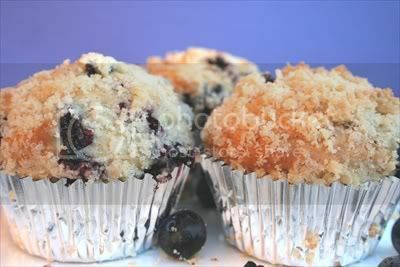 *Divide crumb mixture over muffins. *Gently press into top of the muffin batter with finger tips. * Bake until slightly golden and a toothpick inserted in a center of a muffin comes out clean, about 30 to 35 minutes. Cool in pans for 10 to 15 min and then transfer muffins onto racks to cool completely. Thanks so much for your sweet comment on my TV segment!!! 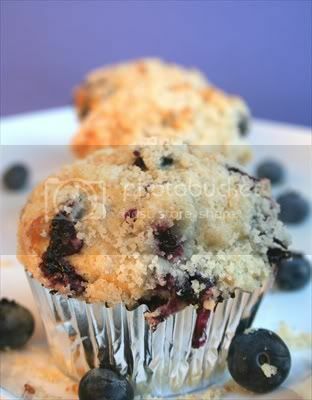 I love blueberries and your muffins look delicious!I'd love to guide our readers to your site if you won't mind.Just add your choice of foodista widget to this post and it's all set to go, Thanks! 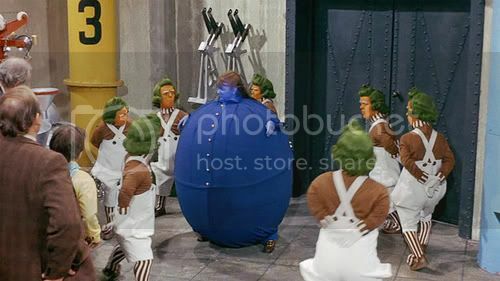 Violet your turning violet, Violet!!! I have always wondered what they did with all that juice after juicing her? Muffins look tasttastic by the way! you forgot to mention when to add the milk... I assume after the sour cream. They are in the oven right now, and they look delicious! Oh Andrea, I think you're going to love them!!! Please come back and let me know what you thought! Thank you for pointing out that I omitted when to add the milk, and yes you were correct is assuming it was after the sour cream. My apologies. I can't wait to hear all about them! I somehow navigated on this recipe (as well as your blog) and made these muffins last night. Marvelous!! My husband loved them and so did I. Thank you so much for sharing a wonderful recipe. I look forward to trying more of your recipes and hope to see you posting again soon. I used to be so scared of Willy Wonka... Therefore, I hated blueberries. Thankfully, I've since overcome that! Hi! I found this blog in Foodista and followed it here. One of the things I love the most about visiting great blogs like yours is I get to not only see food I've never seen prepared before, but you get to read about how they taste. Love it..... & now I'm hungry .... again :) By the way a busy mom like me doesn’t have much time surfing online to look for great food blog like this, so I rely on Foodista Widget. So please keep adding those lovely widget to every blog you made so moms like me can view your post efficiently. Thanks! can i use yogurt instead of sour cream ?